An undergraduate job in a lab over winter sparked a career focus on lung disease Dr Chantal Donovan’s move to a world-leading respiratory medicine research centre in Newcastle. Chantal can pinpoint her interest in science as being sparked in high school so she decided to enrol in a Bachelor of Science at the University of Melbourne to help hone her focus. It was while studying pharmacology in her second year, that Chantal found her passion. Not just content with knowing that drugs worked, Chantal ended up majoring in pharmacology and biochemistry because “I wanted to fully understand how the drugs worked,” Chantal says. It was during her third year of study that Chantal met a pivotal force in her research: Dr Jane Bourke. “Jane took me on as a winter student and we did a great deal of work into asthma models that really set me on my research path.” Chantal ended up doing honours, and then a PhD with Jane looking at novel therapies for asthma and COPD. And this research has continued to inspire Chantal’s work. “We were looking at two different drugs and their impact on airways. The first was rosiglitazone, a drug used for treating type II diabetes which we found actually had an effect relaxing the airways. The second was working with the bitter taste receptors on the tongue. We found that not only are these receptors in the airways, but the drugs that work on them can work to relax the muscle too. Chantal has already published a substantial body of work, with 18 peer reviewed publications and 25 abstracts as 1st/last author. Her work on understanding the pathogenesis of lung disease, identifying novel targets and therapeutics has been recognised by at the Thoracic Society of Australia and New Zealand and the Australasian Society of Clinical Pharmacologists and Toxicologists society meetings. A prestigious British Pharmacological Society/ASCEPT Outstanding Young Investigator Award and an array of competitive grants, visiting fellowships and travel awards are testament to Chantal’s standing in the field. Chantal was invited to session chair at the 2016 European Respiratory Society Annual Scientific Meeting in London, and has been a reviewer for a range of journals. 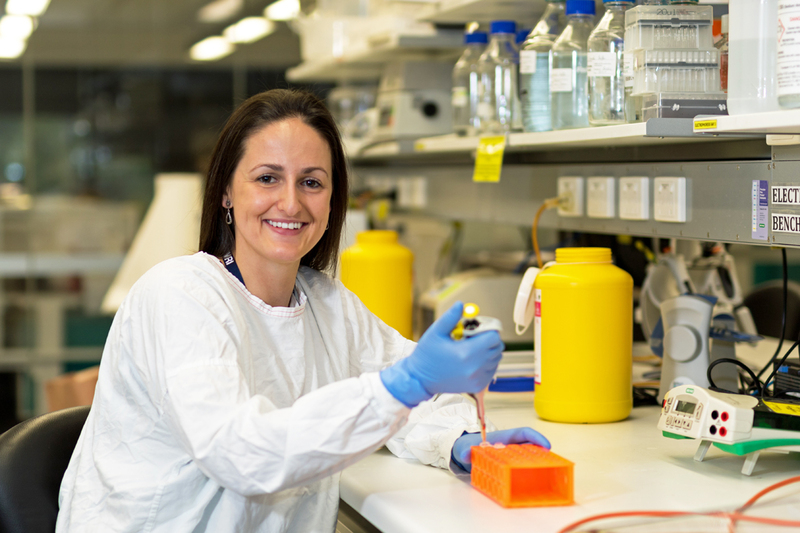 Before moving from Melbourne, Chantal applied for an NHMRC Early Career Fellowship to work with Phil’s team exploring lung diseases and potential new treatments and preventions. Lung diseases are a major burden on the Australian population and economy. With this work, the team will assess the potential of a new target (IL-33) and therapy (anti-IL-33) in suppressing remodelling in experimental models and human tissues. Thanks to the success of this application, this work will be a continuation of some of the work that Chantal explored for her PhD “It’s a nice trajectory really,” she adds. Passionate about raising the profile of science, Chantal attended Science Meets Parliament in Canberra in March 2017. This bi-partisan annual event has been held since 1999 with the aim of urging “all political parties to recognise the importance of science to the nation’s future; economically, socially, culturally and environmentally”. “By bringing together scientists and politicians, it provides a platform to bridge the gap in knowledge, in particular the needs and concerns of scientists at a government level, with the ultimate goal raising the profile of science in Australia. Ensuring that research into lung diseases is effectively funded is a focus on Chantal’s, who acknowledges that science communications and outreach is just another item on a researcher’s to-do list. Australia has one of the highest rates of lung disease in the world, with one in ten Australians living with a respiratory illness. Chantal’s aim is to help identify gaps in our knowledge which will start to help us identify new therapeutic targets and biomarkers. Watch this space.